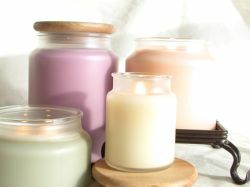 Four candles in four sizes, I love the frosted jars and the wooden tops, visually very soft and relaxing, the scents are lovely but gentle. These are very fragrant candles It has taken me a long time to find the soy candles I want and finally searching the web I have found the perfect candles. I purchased the, evergreen,lemongrass-sage,-lilac, and jasmine candles! The staff is also very helpful and pleasant, I will be back for more.